Walking on the seashore, I am often struck by the diversity that can exist in a very small area. Certainly you can observe a range of features and life forms if you walk in a forest or across a grassland, but on the shore the diversity effects are magnified and multiplied by the juxtaposition of land, air and sea. Physical forces above and below tide line act upon the water, sediment, and rock; life forms respond to this complex and dynamic system with their own complexity and dynamism. 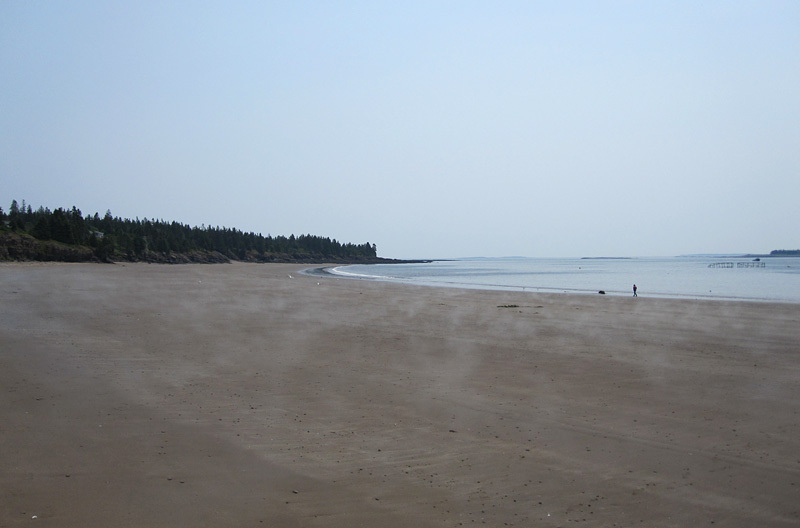 On a summer morning the beautiful sands of Seal Cove beach may seem like a peaceful, idyllic place for a walk, but even at a time like this the change is constant, and if you look you are bound to be surprised. 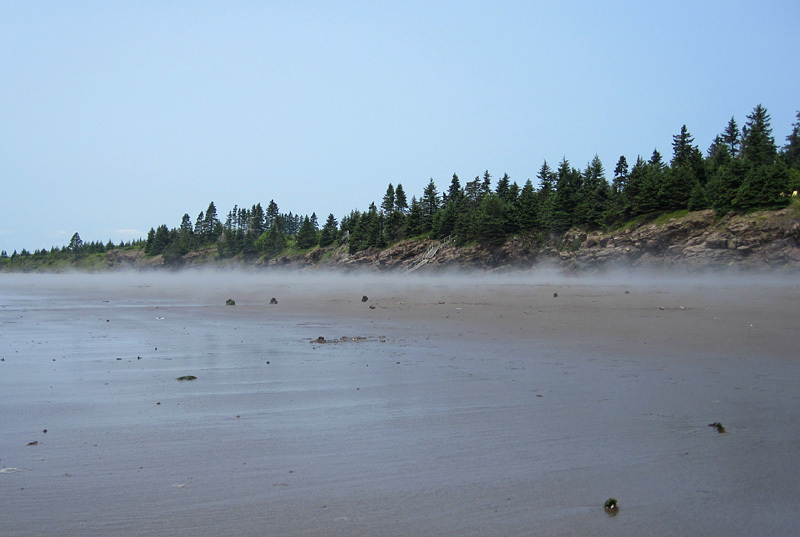 The warming sun drives the last mist from the sands of Seal Cove beach. 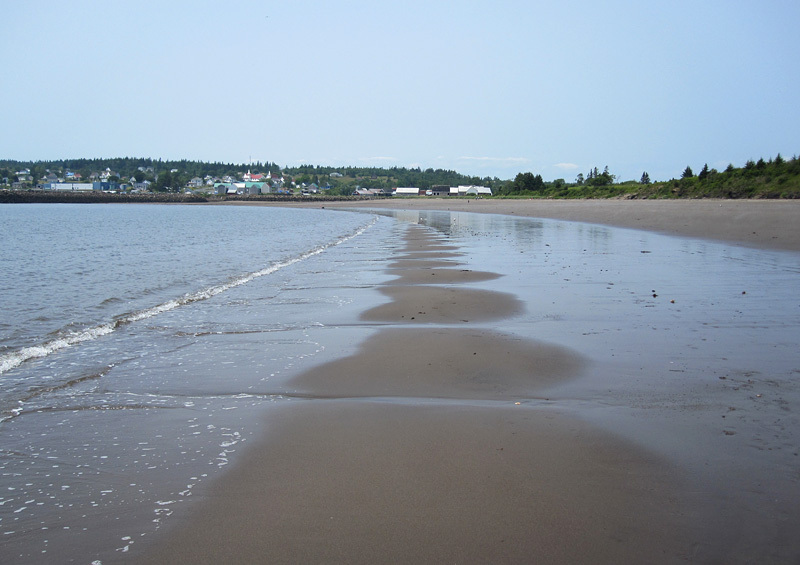 What is the physical process that causes these remarkably regular tidal channels to form along the beach? I’m sure that there is an M.Sc. thesis to be found here! 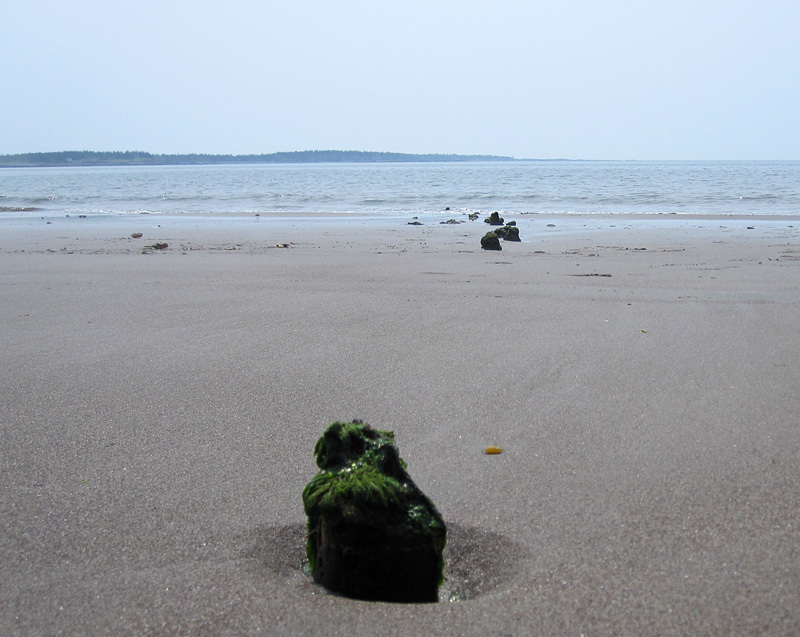 Old pilings protruding from the sand serve as homes for algae and invertebrates. To understand how gulls predated or scavenged this crab, simply follow the footprints and traces backward. At the far end of the sandy beach, a sloping shelf of bedrock marks the transition . . .
. . . to a seaweed-encrusted rocky shoreline. 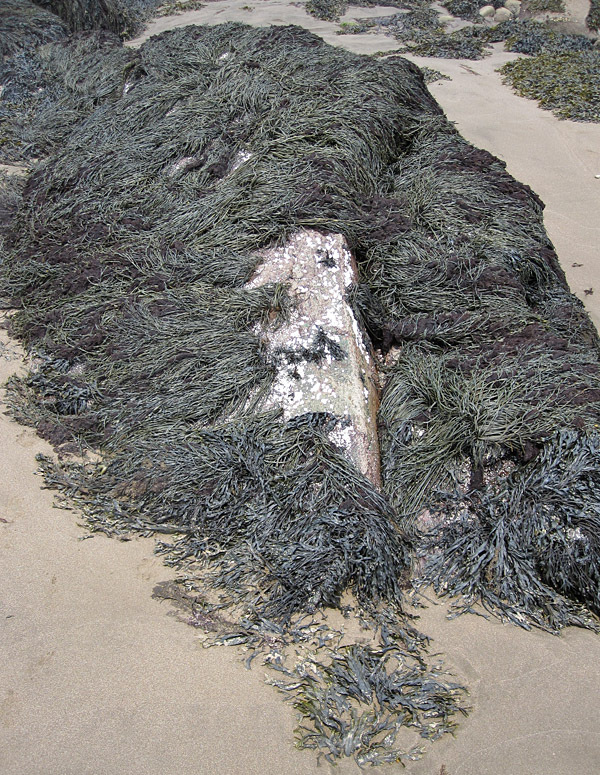 On this spur of rock, the crest of a seaweed toupee is peeled aside to reveal a bald pate. 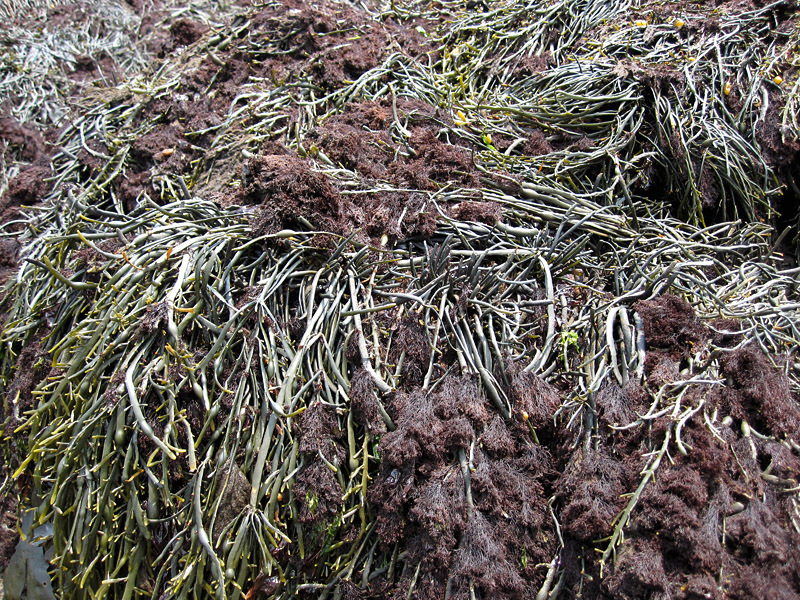 If you start lifting the seaweed to look underneath, you will appreciate that a square metre of this rocky shore must host hundreds or thousands of plants and animals. 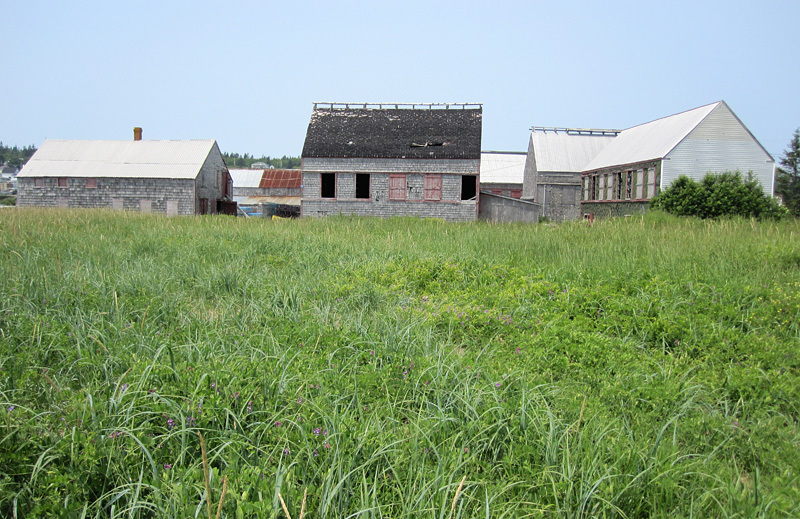 At the village end of the beach, behind the grasses and beach peas, the wonderful disused smoked herring “stands” have been rightly declared a National Historic Site, but most of them still await conservation and, perhaps, repurposing. For information about the Seal Cove National Historic Site, see here. Thanks, Jane. 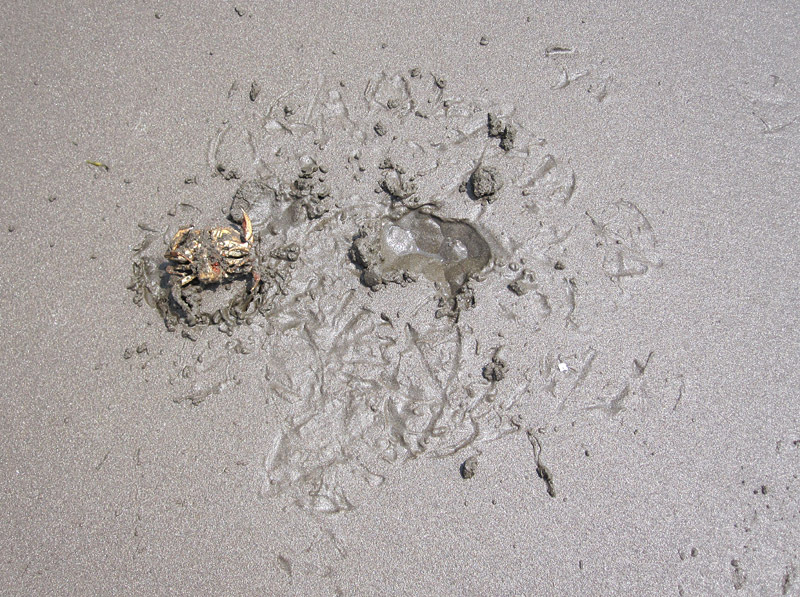 We always look for sea glass at Flagg’s Cove, but given the amount of broken glass at the inner end of Seal Cove beach, I’m not surprised that the sea glass is good there too! I love this type of post. 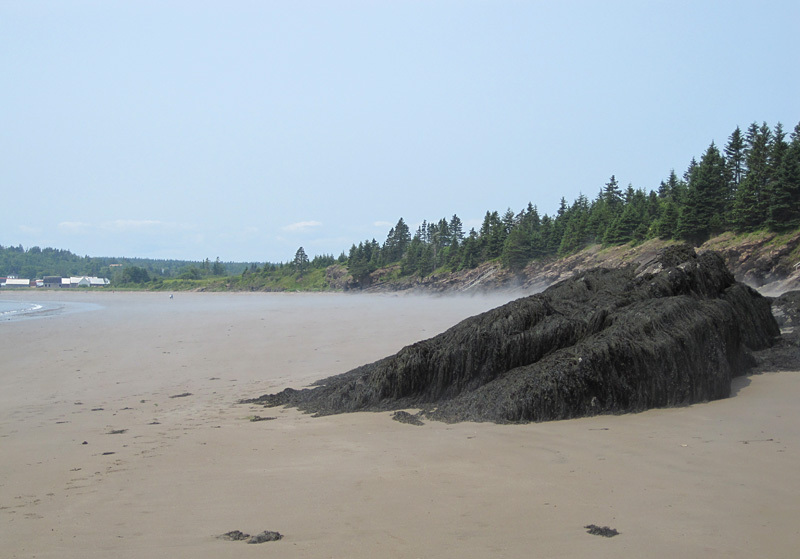 I remember fondly my excursion along the Bay of Fundy doing the same thing – observing the fossil cliffs and all the thing that happen as the tide comes in and out. Oh what a time it was …. Thank you, Sam! The Bay of Fundy is so endlessly surprising and entertaining. The sloping bedrock layers are Triassic lava flows, part of the Seven Days Work Member of the Dark Harbour Basalt. Unlike the thick member below it, the middle member lava flows are often tilted in wide synclines and anticlines. 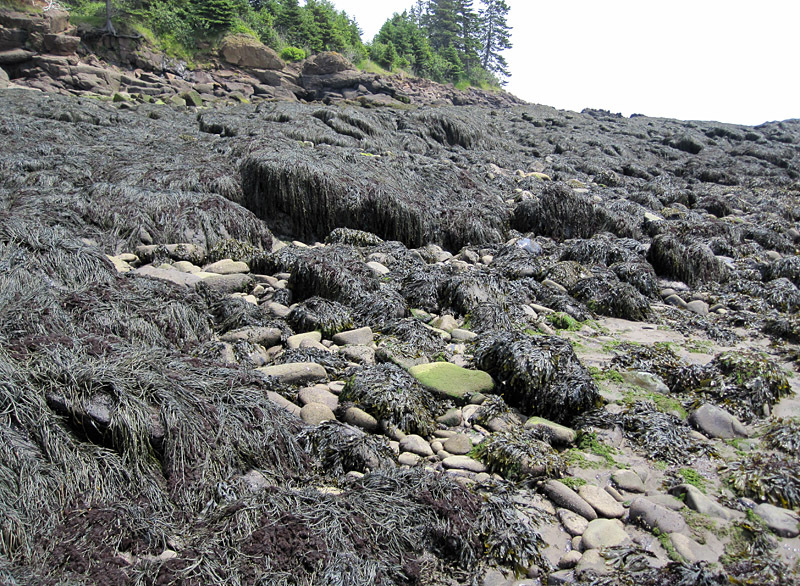 The flows at Seal Cove Beach are on the eastern limb of one of these synclines. Thanks, Greg. I specifically avoided commenting on the Seal Cove geology, because I realize that it is complicated! By the way, I thoroughly enjoyed your exhibits at the museum. Wonderful article…beautiful photos. wish I was there right now~! Doris, thanks, so do I! A beautiful place especially the marshes, Castalia at night has a spectacular sky. The ferry ride can be challenging sometimes! Gary, you are right. In the past few years, there always seems to be a ferry pulled for repair at some point when we are there. Life is never boring looked this way! I love thinking of all the worlds running at the same time as ours, and all the things happening in one space.. And, love those smokehouses! Thank you! Yes, that thought of everything going on at once is so mind-boggling!